Let’s stop throwing the word around like it’s a mantra, hoping you’ll actually get some work done in the next hour. If you’re one of those with a steadfast concentration and robotic willpower then this article is not for you. Move along. For the majority of us, it’s safe to say that productivity plays victim to procrastination and distraction. It seems like the two are in cahoots and determined to bring the entire working population to its downfall but fear not! 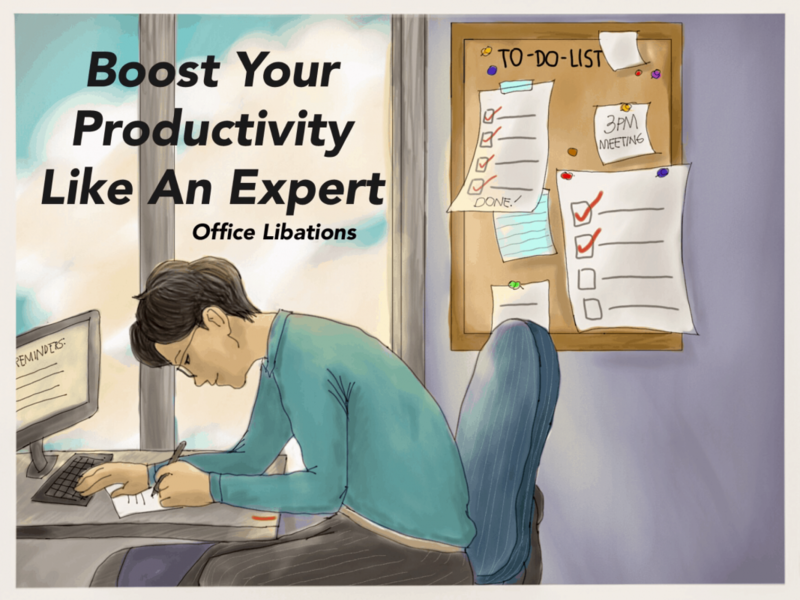 We’re here to tell you that it’s possible to improve your productivity. There are reasons why we are not as productive as we’d like to be and there are factors that play into that. When you think of productivity what do you think of? Often times you’re going to think in reference to yourselves as opposed to a large company. When we think of our own productivity this is what we refer to as personal productivity. We specify personal productivity as the goals that one wishes to achieve. What do we want to get done in a day? What are we capable of doing and how can we maximize our efforts to improve upon our task completion? The issue that most encounter is how to see these ambitions through. Now do not confuse productivity with efficiency as they are two separate terms. In other words, productivity refers to the rate in which one produces an output or completes a task. The focus here is on quantity. It’s like saying the more tasks one completes or the faster they do something then the more productive they are. Say someone working in an office completed 5 tasks one day, 6 tasks the next, and 7 tasks the day after. They’re considered more productive than they were those days before because they are completing more tasks each day. Efficiency is a little different. The focus here is on quality. Let’s go back to our office employee example. If they complete an ‘x’ number of tasks compared to their colleague who completed fewer tasks, then they’re considered efficient. The difference here is that the person in our example is being compared to a standard amount of tasks completed per day. They’re doing more with their limited time as compared to the normal rate. The overall goal here is to achieve a balance between the two. Strive to be productive but efficient as well. Before we give you some insight on how to reach said balance, let’s get into why people struggle to be more productive throughout their day. The darnedest things tend to distract us when we have important matters to attend to. Funny how that loose thread on your left sleeve suddenly deserves 100% of your attention that instant. We’ve all been there. We’re trying to get things done but distractions tempt us one right after the other. When you’re in an office, you likely devote most of your time to a computer screen. This is especially dangerous because it’s very easy to fall down the black hole that is the internet. Interruption science is exactly what it sounds like. It’s the study behind how and why interruptions distract people from their tasks at work. According to researcher Gloria Mark at the University of California Irvine, workers are interrupted from their tasks every 3 minutes. The amount of time it takes to regain focus is nearly 8 times that amount. Some would say that multitasking is a solution to this issue and logically, it makes sense. Work faster, get more done between distractions that way it’ll make up for said distractions in the first place. Yet this theory proves no good since it’s found that workers experienced more stress when trying to increase their speed. The same goes for multitasking. The reason multitasking is a futile effort is that the act of switching between several tasks is a distraction in itself. If you’re on a conference call with someone while sending emails while also scheduling your next meetings, you’re not going to get much done. According to David Strayer at the University of Utah, only 2% of people can multitask successfully. It can take a person up to 50% longer to complete a single task if they are multitasking. People cause 44% of their own interruptions. Here are some other reasons why you should consider dropping the multitasking habit. Well, aside from single-tasking? There are several paths you can take to boost your own productivity AND being efficient about it. Suffice to say goal setting is a must if you want to stay on top of your schedule. It’s a strong way to maintain progress. It’s also a way to hold yourself accountable for work done on a daily, weekly, and even monthly basis. Goals are like the life raft in the midst of a vast ocean: they give you a sense of direction. They keep you focused, and they can even provide you with a sense of motivation. So create smart goals that are attainable, relevant, and measurable. Ever heard of intrinsic motivation? If not, here it is in a nutshell: it refers to the pleasure one gets from performing a task out of genuine interest or enjoyment. Thus, find a way to motivate yourself intrinsically. A great way to motivate yourself when working is to ask yourself why you’re doing what you’re doing. Don’t edit a document simply because your boss told you to do it. What if editing that document will help make the sales people’s lives 10 times easier? Find a greater purpose in the work that you do. Being useful is a great way to derive satisfaction in the workplace and can be very motivating. Of course, there are much simpler ways to stay motivated. Reward yourself with a nice lunch if you finish a certain number of tasks. Staying positive, asking for feedback from peers, and setting goals are all great ways to stay motivated. Time management is one thing we can all improve upon. We may think we’re using our time wisely, only to find that we have yet to do all the things we set out to do that day. There is so much help you can find online thanks to the one and only oracle, aka Google. Here are some brief tips to help you make better use of your time. Don’t let your emails manage you. Your first instinct upon opening your eyes in the morning shouldn’t be to check your emails. If you fall victim to those who check it religiously, then learn to suppress the urge. Your emails are not going anywhere. Checking one email can lead you down a road of mundane tasks that you can leave for later. Learn to organize your inbox by sender or subject line so that when you do check your email, you can focus on only the important ones. Don’t use your emails as a way to get out of doing more important work either. If you’ve got something particularly urgent, turn off notifications. That’s one less distraction you have to worry about. Wouldn’t you like to be one of those people who somehow manage to complete an entire day’s work in a matter of hours? Everyone works at their own pace. But there are habits that productive people share that can help you make a dent in your own progress. If you wish to be as productive as possible, here are some of the most helpful habits that highly productive people possess. Like we mentioned before, prioritizing your tasks and to-do lists can help you stay on track of your duties. Spend a couple of minutes in your day to decide what MUST get done by the end of your day and what you can do another time. Focusing on high-value tasks will make effective use of your time and you will feel accomplished for it. There’s something out there called a distraction list. It’s like facing your fears, but you’re facing your distractions head on. Or if you’re a yogi, think of it as meditation. You’re acknowledging your distraction, but as soon as it crosses your mind you write it down and move on. What this does is it gives those thoughts a place to go so you can get back to whatever you’re doing in the moment. Some of the most productive people out there have some sort of routine from the moment they wake up to the moment they hit the bed. It gets a rhythm going for the day. Routines don’t allow for odd time gaps where you can spend it doing mundane things. So set out the first thing you must do when you wake up. How are you going to transition away from work mode at the end of the day? It’s all about how you choose to get the ball rolling throughout your day in the smoothest way possible. Think of it this way. Say you’re trying to run a 10K race. Seems a bit daunting right? Break it up into chunks and it might seem a bit more do-able. Run to the 2-mile mark and you’re one-third of the way there. Run another 2 miles and you’re two-thirds of the way there. The same goes for your work. If you’re looking at it from the perspective of a person looking at Mount Everest, you’re never going to get much done that way. Break your work up into sections, set milestones to reach, and you’ll make progress in no time. Being productive is harder than it sounds. It’s not something to master in a matter of days and requires consistent control over most of the activities in your day. Maybe you’re not one for a ‘distraction list.’ If you find that this helps you in no way, then don’t do it. Know the difference between ‘getting things done’ and ‘getting the right things done.’ It’s all about finding that middle ground between productivity and efficiency where you’ll find most of your best work gets done. The good news is: you’re more than capable of boosting your own productivity. Cut the distractions, form good habits, and take a look at what others are doing to find methods that work for you.